It’s time for another giveaway here on Mickey by Mel! This time we are giving away a handmade countdown calendar. 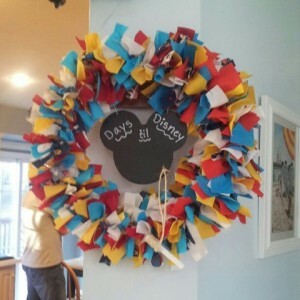 This Disney inspired creation is a Mickey rag wreath with a chalkboard center shaped like what else – mouse ears! Don’t worry, the chalk is attached by twine to the chalkboard so that you never have to go hunting around to find a piece of chalk. After all, who wants to waste time searching for chalk when it is time to count one more day off until your next Disney trip! Don’t have a Disney trip planned? Well, that leaves you with a few options – book a trip! (I am always happy to help people plan trips to Disney), use it to countdown until your next getaway to somewhere else (even if it is just a “I’m doing nothing at home” weekend – we all need something to look forward to! ), or remove the calendar piece from the center. No matter how you use it, it is certain to brighten up the end of winter in your house! Good luck to everyone and don’t forget to tell your friends! Super cute wreath. Very cute idea. We have way too many to count. We will be doing a cruise (Disney) next May, 2014…so I don’t even want to start a countdown yet. I just got back a little over a week ago. We returned one month ago today from our 10 day Disney vacation. Normally we go in January of each year but now we have to wait until next October so it’s about 575 days….but who’s counting?! No trips planned as of now. 🙁 Hoping to go on a cruise in 2014. 93 days until we sail on the Fantasy!!! Hoping to go when my daughter gets over her fear of costumes. She said she’ll be good when she’s 5 (she’s 3 now). We went to Disney in September but we love it so much we are going back in June for summer vacation. The kids are so excited – last time we drove – this time we are flying. Since I’ve been back for just over a week… 260? Well, I’m hoping that we’ll be at Disneyland for Easter…but the hubby is trying to put a stop to my big plans! I think I might be able to win this one though! Way too many! 588 more days! We weren’t able to plan a trip for this year 8( :0( this will be our first year since 2006 that we haven’t been. I’m having withdraws! My next vacation is not soon enough!